The Cabin at Mouldsworth, CLC to BR. What is now Chinnor Signal Box was erected as "Mouldsworth Dwarf Frame" at Mouldsworth in Cheshire in 1894 to work the main line connections (points and signals) at the "country" end of the yard there. It functioned as what the Great Western would have called a "ground frame", and was released (supervised) by the Mouldsworth Junction signal box at the other end of the yard/station layout. 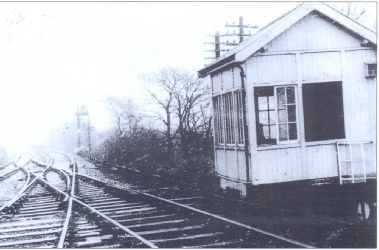 Mouldsworth station had a diverging junction at one end, overlooked by Mouldsworth Junction signal box. At the other was the goods yard which had main line connections at both ends. The nearest points were worked by the Junction box, but the distance to the far points was too great to work mechanically from there. Electrickery was yet to come to the railway. The Dwarf Cabin was built to deal with movements over these points. The cabin's 12 lever Cheshire Lines Committee (CLC) lever frame included two release or "bolt" levers. To move the points in the main line, it was necessary for one or other of these levers to be first reversed. One allowed moves to/from the Up line, the other the Down. These bolt levers could only be reversed when released (''unbolted'') from the Junction Box and the interlocking there then prevented conflicting train movements. Train movements in and out of the yard were controlled by shunt signals worked from the Dwarf cabin. It had no main line running signals, these being worked from the Junction Box. The "Dwarf" Cabin seems to have become known simply as "Mouldsworth Yard Frame" over the passage of time. It closed in 1967. So far as we know it retained its 12 lever CLC frame throughout. At some time (mid 1950's?) the two mechanical releases were replaced by electrical ones. There is some mystery, however. Some of us at Chinnor were a little surprised by the design of the cabin. It seemed unusually grand for what was "just a ground frame". In particular, it is unusually high, since a more typical design might have had the eaves immediately above the window frames. Why? It is difficult now to read the minds of those employed by CLC when they wrote the specification around 122 years ago. But subsequently it has emerged during restoration work that the cabin was originally built with a porch and landing, making it even more grand. Then at some stage the porch was removed; it didn't just rot off, as a replacement barge board and other parts were properly fitted). So one question must be: was this cabin actually designed as Mouldsworth Dwarf Frame, or was it an even earlier signal cabin which had been outgrown elsewhere and was re-allocated? After closure, the cabin stood forlornly for a period. Then came an offer of salvation.